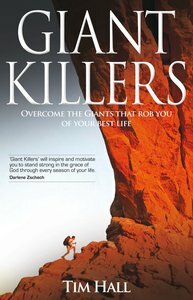 Overcome the Giants that rob you of your best life! The motionless form of a giant of Gath lay face down on the battlefield of Shochoh and blood from his forehead seeped into the earth below his face. The great intimidator Goliath, champion of Philistia, lay motionless. His terrifying words had ceased. A smooth stone from a shepherd boy's sling was embedded in his skull. Goliath was finished. For the shepherd boy David, this was a giant-sized step into the awesome place of destiny that God had ordained for him. It was a step from obscurity and rejection to kingly dominion, fame and wealth, global and eternal influence. It was a step that was ultimately felt as Messiah took His place in history establishing His Kingdom on Earth. Like David, an army of giant killers has been prepared by God for this hour. Often with small flocks and in lonely places of isolation, rejection and insignificance, this body of men, women, boys and girls is receiving its training for the most fruitful, significant time ever planned for world history. The giants we face are not going to destroy us. We are not their prey They are ours. They are food for us. They are to be swallowed up by God's anointed champions, by the mighty power indwelling us. They are "our breakfast", strengthening our resolve to step up to each new day. "I truly believe this book is a must read, it will inspire, motivate and will change your life." "Tim's teachings will encourage and inspire you that with God's help, anything is possible." - Brian Houston, Senior Pastor, Hillsong Church. "I know this book will empower you to live your life, ruling in your world, through the power of Christ." - Phil Pringle, Senior Minister - Christian City Church Oxford Falls, President of C3 Global. "This book written by the hand of a great artist... one of the leading Evangelist of our Day, a great Australian Artist, an Australian Legend, a man who loves people, loves God with all his heart." - Dr Rodney M Howard-Browne, Tampa Florida. Tim Hall is a dynamic preacher whose emphasis on miracles, signs and wonders is impacting on the church globally. He is one of Australia's best known and well-loved evangelists conducting miracle campaigns, conferences and citywide healing rallies throughout the world with crowds up to 100,000 in attendance. He is the founder of Tim Hall International Ministries Inc. and has pioneered and pastored churches across Australia. He is married to Jacquelyn and lives in Adelaide, South Australia.